CajunGrocer.com is a home away from home for many Louisiana natives and fans of this powerfully flavorful cuisine. We carry over 1,000 authentic Cajun, Creole, as well as New Orleans food and specialties, including classic boudin, Mardi Gras King Cakes, fresh crawfish, and our award-winning Turducken. Whether your taste buds crave more traditional delicacies or adventurous takes on meats or seafood, we guarantee you will find something to love and devour by exploring our selection today. Better yet, our shipping rates are the lowest when it comes to shipping perishable foods, guaranteed. We hope you enjoy your brief stay with us, where the food is fresh and the people are friendly. Our customers can’t get enough of our Cajun foods, but one of our most popular delicacies is our world-famous Turducken. Why wait for the holiday season when you can enjoy the festivity of a three bird roast any night of the week? Our quality meats have been voted Best Overall and Best Value by the Wall St. Journal and were featured on the FoodTV Network. In addition to our succulent roasts and boudin food, we also offer rolls, ham, stuffed chicken, turkey breast, jambalaya, casseroles, dressings, choux, bread pudding, hush puppies, and so much more. Fresh seafood is somewhat of a specialty here, and discerning culinary aficionados rely on the freshest selections for their signature recipes. Shop from our assortment of live or boiled crawfish, frog legs, oysters, shrimp, crab, alligator, lobster tails, and freshwater fish. Take the night off and avoid the hassle of cooking by taking a look at our prepared New Orleans food. We offer crab cakes, stuffed breads, étouffée, gumbos, bisques, beans and rice, au gratin, meat or seafood pies, smothered okra, and other succulent dishes that are sure to delight even the pickiest eaters. Satisfy your sweet tooth by browsing our excellent selection of Cajun desserts. We offer authentic pralines, King Cake, bread pudding mixes, jellies, syrups, molasses, and other scrumptious treats that are sure to seal any meal with a sugary twist. If you’re looking to introduce new desserts and specialty dishes to your cookbook, explore our dozens of delightful recipes to get inspired. If you're not in a hurry, select ground shipping and reap the benefits of a low shipping cost when you place your order. 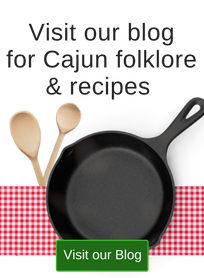 If you have any questions about our Cajun foods, please contact a member of our team today! Sign up now for CajunCash® and earn valuable points toward free merchandise - it's fast and free to join! You’ll earn thirty points for every dollar you spend on products from us. You can redeem your points toward future purchases. Track the number of points you've earned at a glance through your online account. Plus, we'll save your personal preferences to save you time when you place a purchase. Sign up for a free CajunGrocer account and you’ll receive 30 free CajunCash® points. Once you set up an account, refer family & friends and receive an additional 30 points for each referral. If you already have an account, just click the button below to sign-in and see how you can get rewarded!